The oil price downturn has hit Chevron Corporation (NYSE:CVX) hard. But that's true across most of the oil and gas industry. And while Chevron is a great company, there are other options that you should be considering for dividend safety and yield. Here are three better dividend stocks. Chevron is an oil major with a broadly diversified business. For example, its refining and chemical operations help to offset weakness in drilling when oil prices fall, as they have been of late. But Chevron isn't the best oil major. That distinction belongs to competitor ExxonMobil (NYSE:XOM). 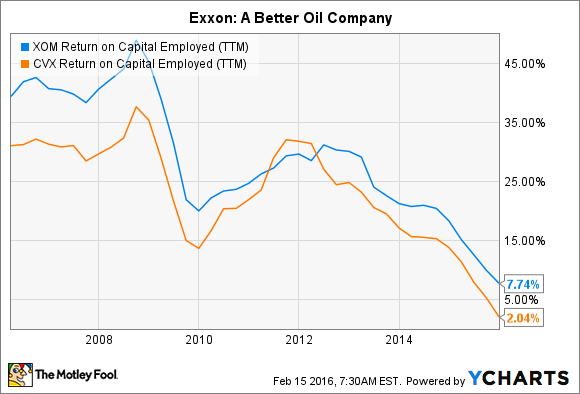 Although there are various ways to make this case, to keep things simple, Exxon, in most years, beats its peers on return on capital employed. Essentially, that means that Exxon makes more money than other oil majors for every dollar it puts to work. Now, Chevron's 5% yield is much higher than Exxon's 3.5% yield. But there's a reason Chevron's yield is so high -- it looks like the company will have to take on debt to support that payout and keep investing in its business if oil markets don't turn higher. Exxon could find itself in the same boat if oil remains moribund, but if you're looking at Chevron, why not consider shifting up the quality scale to Exxon? For reference, Exxon's yield hasn't been this high since before the turn of the century. That said, if what you want are big yields, then you should take a moment to examine the limited partnership space. Two names that stand out right now are Enterprise Products Partners (NYSE:EPD) and Buckeye Partners (NYSE:BPL), with yields of around 6.8% and nearly 8%, respectively. Enterprise is one of the country's largest pipeline operators. Although it has some exposure to commodity prices, the vast majority of its business is tied to long-term toll-taker contracts. Essentially, it gets paid based on the use of its pipeline and storage facilities, regardless of the price of the oil and natural gas flowing through them. To give you an idea of how solid the business is, despite the energy route that's been going on since mid-2014, Enterprise's distributable cash flow increased around 30% year over year in 2015. That's the money that it can pay out to unit holders as distributions. And at this point, the company is expecting to up the distribution around 5% next year, which would push its annual increase streak to a full two decades. This isn't exactly an oil driller, but Enterprise lets you take advantage of the oil downturn without taking on all the risk of owning an oil-dependent name Chevron. Buckeye, meanwhile, is a bit more risky. The company also owns toll-taker assets like pipelines and terminals, but it didn't cover its distribution in 2015. In fact, coverage was only 0.89, which means it didn't produce enough distributable cash flow to "cover" what it paid investors. For reference, Enterprise's coverage ratio was a solid 1.3. So why even look at Buckeye? There are three reasons. First, its yield is notably higher than what you can get at Enterprise or Chevron. Second, it's increased its distribution annually for 20 years. Third, Buckeye expects to increase its distribution again in 2016 as a big project in Texas starts to bear fruit. The completion of this project should also improve the coverage ratio. So this is a bit more risky, since a lot hinges on the success of new projects, but there are solid reasons to expect improvement in the company's distribution coverage. Now you might be wondering if the bankruptcy of oil companies will have a big impact on pipeline companies. The answer isn't as dire as you might expect. Yes, some contracts might get renegotiated and system volumes could drop, but pipelines transport oil and natural gas from where it's drilled to where it's used. In other words, Enterprise and Buckeye have vital assets that have to remain in use if the owners of wells want to sell their production. So if you're looking into Chevron, you might want to broaden your search out a little. For the risk-averse, industry-leading ExxonMobil is looking cheap right now. Yes, the yield is lower, but Exxon is probably the best run oil major. For those only interested in yield, Enterprise and Buckeye are both solid businesses in the pipeline space with higher yields. This area is more toll-taker in nature, so actual financial results haven't felt as big a pinch from oil price fluctuations even though investors have soured on the sector as oil prices have fallen. Of the pair, Buckeye is the riskier company, but for a near 8% yield it might be worth it for more aggressive investors.